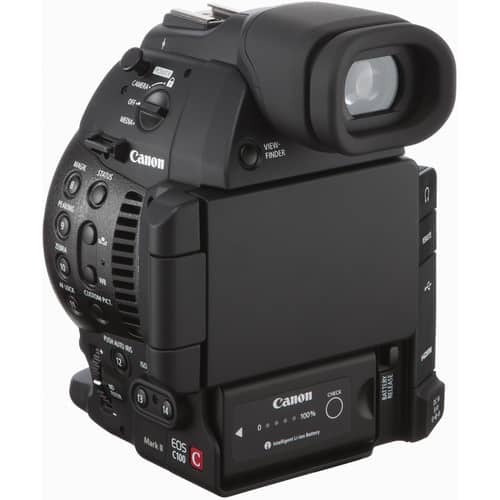 The Mark II also adds a variety of upgraded features including face detection AF, MP4 recording, additional frame rates when recording in AVCHD and slow & fast motion options when recording in MP4. The Mark II also has an additional microphone on the camera body for recording sound when the top handle is removed. 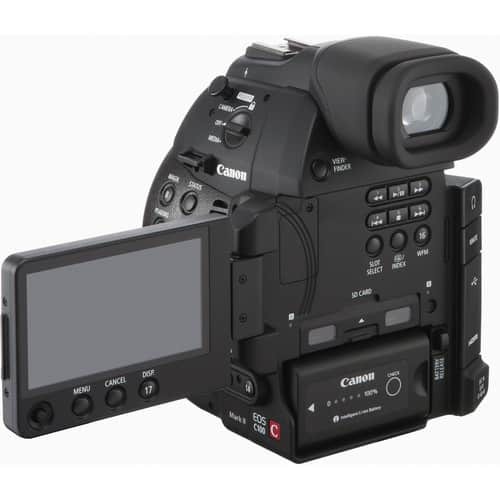 It incorporates a 3.5″ OLED display with increased resolution, and the EVF is now almost twice as large as on the original C100 and tilts as well. 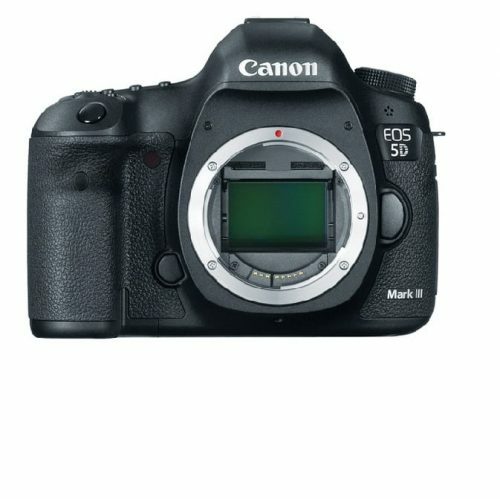 The Mark II supports GPS, and features built-in wireless functionality. 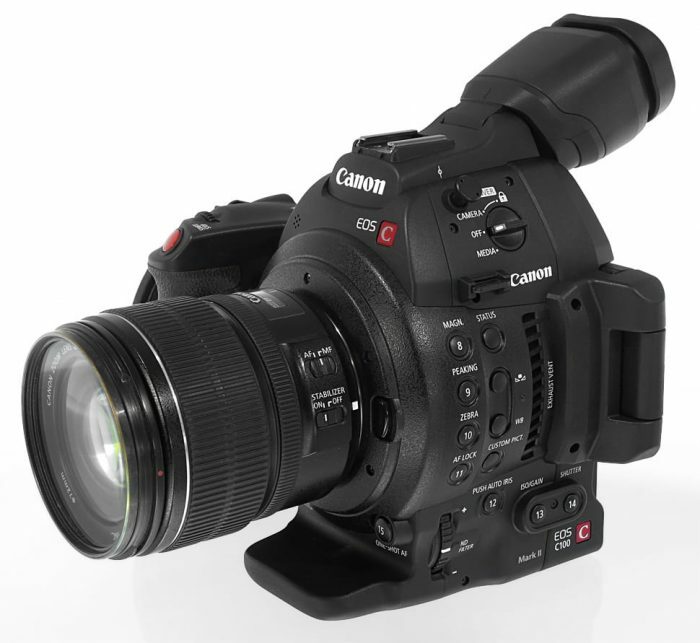 The HDMI output supports timecode, as does the original C100, but it also supports Canon Log LUT. The EOS C100 Mark II uses the same Super 35mm Canon CMOS sensor as its big brother, the C300, but uses a Digic DV 4 processor. With an EF lens mount, the camera is compatible with the full range of Canon EF, EF-S, and EF Cinema lenses. This is particularly useful for DSLR shooters who have already invested in Canon lenses. The camera uses the AVCHD codec to record 1080pvideo up to 24 Mbps. It supports dual SD/SDHC/SDXC memory cards which, thanks to the efficient AVCHD codec, allows you to record nearly three hours of HD video on a single 32GB card. For professional applications, you can also record clean, uncompressed 4:2:2 video with embedded timecode via the HDMI output. The Continuous AF (Autofocus) function for all autofocus lenses, using Dual Pixel CMOS AF technology. A new AF Lock setting also lets you change the image framing while holding the desired focus. This feature is ideal for users who regularly shoot with smaller crews, who shoot moving subjects, or who want smoother, more natural-looking autofocus.Dual Pixel CMOS AF technology features a CMOS sensor that consists of an array of pixels that each feature two separate photodiodes. By continuously comparing their outputs during AF mode, phase-difference autofocus helps ensure non-blurred images and smooth focus transitions even when the talent and/or camera are moving. The new feature places a high priority on maintaining sharp focus while providing a natural, smooth autofocus movement with select Canon EF lenses – including newer-generation STM lenses – which offer even smoother and quieter operation. The continuous, nonstop recording function allows you to create In and Out points in the footage every time the START/STOP button is pressed. At this time, the continuous recording function is compatible with Grass Valley’s EDIUS Pro 7 software. Manually move the center of the camera’s magnification viewing area to one of 25 different locations throughout the image frame using the joystick. Now camera operators can easily check focus even on subjects that are located away from the center of the image frame. Canon Log records an image with subdued contrast and sharpness, which preserves a high dynamic range and presupposes color grading in post production. Canon Log Gamma emphasizes rich gradients from mid-range to highlights, resulting in 12-stops of dynamic range. At ISO 850 and above, Canon Log Gamma enables 5.3 stops of latitude above optimal exposure (and 6.7 stops below), broadening the available dynamic range in color grading.Wide DR Gamma yields wide dynamic range by suppressing brightness while maintaining gradations, but is designed to produce finished-looking images without requiring any color grading in post-production. The camera is fully compatible with Canon’s renowned EF mount lenses. 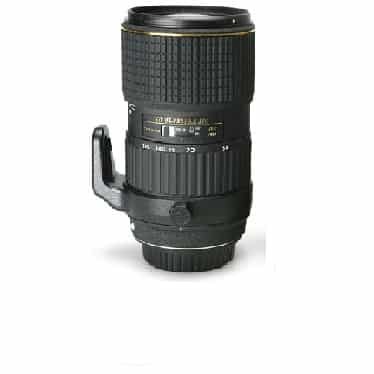 Even specialty lenses, such as Canon’s 24mm f/3.5L II tilt shift lens or the 8-15mm f/4L Ultra-Wide Zoom fisheye lens. 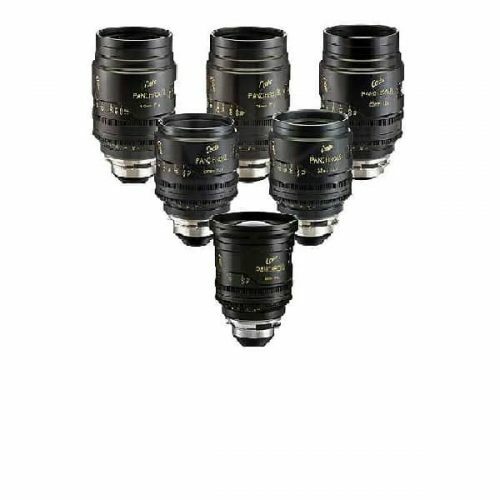 When shooting with EF lenses, the camera features peripheral illumination correction, which automatically compensates for light fall-off in the corners of the image. The camera supports AVCHD bit rates up to 24 Mbps (LPCM) at a maximum resolution of 1920×1080. Frame rates of 59.94p, 50p, 59.94i, 50i, 24p, 25p, PF30, and PF24 are all available to meet the needs of your production workflow. It supports relay recording of long takes between dual SD cards or can write video to both cards for redundancy in the event of SD card failure. Pre REC mode buffers approximately three seconds before the tally light activates. 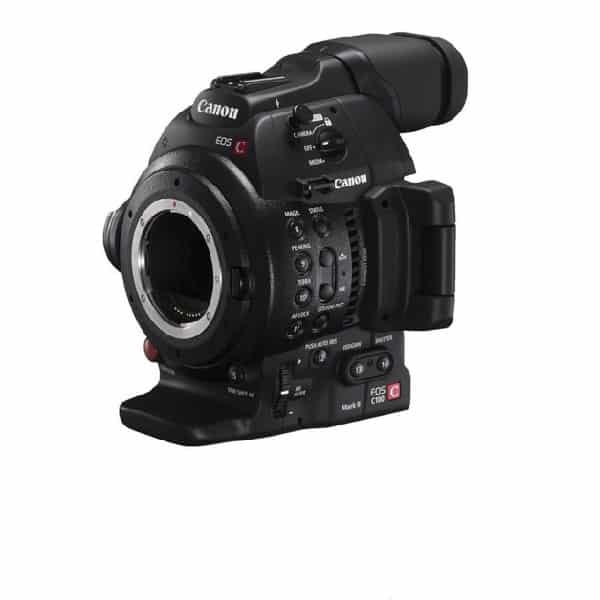 Designed with the solo shooter in mind it is 85% the size of the Canon C300, and it is based on a mobile core design that allows additional accessories to be attached depending on the situation. Strip the camera down for a “run-and-gun” style, or complement the camera with the full range of camera-mounted accessories. With a compact body, you can even shoot dual-camera 3D without an over-sized and cumbersome rig. Its light weight reduces user fatigue and allows even elaborate rigging systems to remain mobile enough for a single operator. The removable accessory hand grip rotates 360 degrees for comfortable shooting positions, while customizable hardware buttons allow the camera to fit your own personal shooting preferences. Accurately check focus, composition, and exposure with the 1.23 million dot-equivalent 0.45″ electronic viewfinder with 100% coverage. The built-in 3.5″ 1.23MP equivalent OLED panel tilts 100 degrees for flexibility when composing tough perspective shots and rotates 180 degrees to protect the screen when not in use. Use the LCD display to review footage or to view the camera’s waveform monitor. 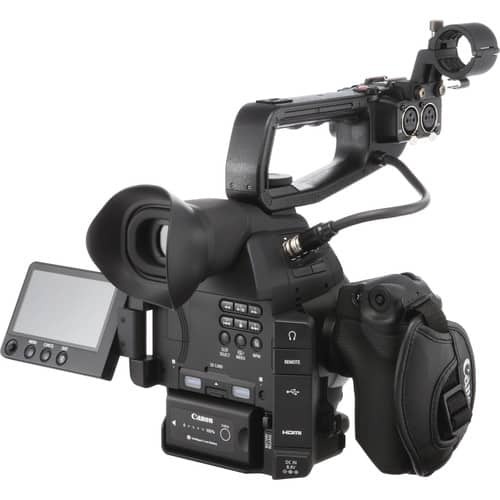 The camera records video to SDHC/SDXC cards using AVCHD, a high-efficiency codec that has quickly become a standard in both the professional and consumer video markets. Maximum bit-rate is 24 Mbps. Video files greater than 2GB are split into multiple files while recording, which are automatically joined together upon import using Canon Data Import. AVCHD video is widely supported across NLE systems and is the standard codec for Blu-Ray.The camera records using the MP4 codec, and can record in fast motion (25% faster) or slow motion (40% slower) in MP4 recording mode.